This is my Veteran's day post during National Indian Heritage Month. As reported at the Department of Defence's page in honor of Native American Heritage Month in 2002. Image from a page dedicated to Ira Hayes at Arlington Cemetery, where he is buried. Ira Hamilton Hayes is a full blood Pima Indian and was born in Sacaton, Arizona, on the Pima Reservation on Jan 12, 1923. His parents Joe E. and Nancy W. Hayes were both farming people. When he enlisted in the Marine Corps, he had hardly ever been off the Reservation. His Chief told him to be an "Honorable Warrior" and bring honor upon his family. Ira was a dedicated Marine. Quiet and steady, he was admired by his fellow Marines who fought alongside him in three Pacific battles. Ira Hayes was a noted World War ll hero. Although he had a normal childhood on his reservation, his life changed dramatically when war broke out and he joined the Marine Corps. After he completed courses under the U.S. Marine Corps Parachutist School at San Diego, California. He was lovingly dubbed "Chief Falling Cloud." Ira Hayes was assigned to a parachute battalion of the fleet Marine Force. By the beginning of 1945, he was part of the American invasion force that attacked the Japanese stronghold of Iwo Jima. On Feb. 23, 1945 to signal the end of Japanese control, Hayes and five other's raised the U. S. flag atop Mount Suribuchi on the island of Iwo Jima. Three of the six men were killed while raising the flag. This heroic act was photographed by Joe Rosenthal, and it transformed Ira Hayes' life for ever. Subsequently a commemorative postage stamp was created as well as bronze statue in Washington DC. President Franklin D. Roosevelt called the brave survivors of the flag raising back to the United States to aid a war bond drive. At the White House, President Truman told Ira, "You are an American hero." But Ira didn't feel pride. As he later lamented, "How could I feel like a hero when only five men in my platoon of 45 survived, when only 27 men in my company of 250 managed to escape death or injury?" Later, they were shuttled from one city to another for publicity purposes with questionable sincerity on the part of the American military. 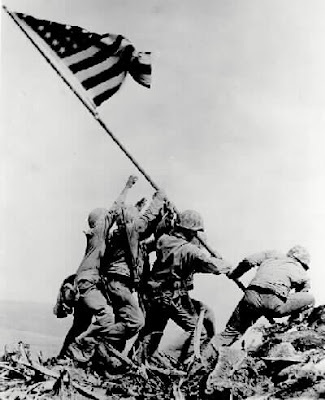 Ira Hayes asked to be sent back to the front lines, stating that "sometimes I wish that guy had never made that picture". The Bond Tour was an ordeal for Ira. He couldn't understand or accept the adulation . . . "It was supposed to be soft duty, but I couldn't take it. Everywhere we went people shoved drinks in our hands and said 'You're a Hero!' We knew we hadn't done that much but you couldn't tell them that." At the conclusion of World War II Ira went back to the reservation attempting to lead an anonymous life. But it didn't turn out that way . . . "I kept getting hundreds of letters. And people would drive through the reservation, walk up to me and ask, 'Are you the Indian who raised the flag on Iwo Jima"
Ira tried to drown his "Conflict of Honor" with alcohol. Arrested as drunk and disorderly, his pain was clear . . . "I was sick. I guess I was about to crack up thinking about all my good buddies. They were better men than me and they're not coming back. Much less back to the White House, like me." He was never able to get his life back in balance again. Ira Hayes died of exposure at the age of thirty-three on Jan, 24th 1955. He was memoralized by the Pima people and characterized as "a hero to everyone but himself". He is buried in Arlington Cemetery. He never married. The story is recounted as a tragedy here. Johnny Cash and Bob Dylan sang about Ira. They didn't write the lyrics which they are powerful even without their gifts. His home community at the Gila River has a website. See other posts on World War 2 and native americans.